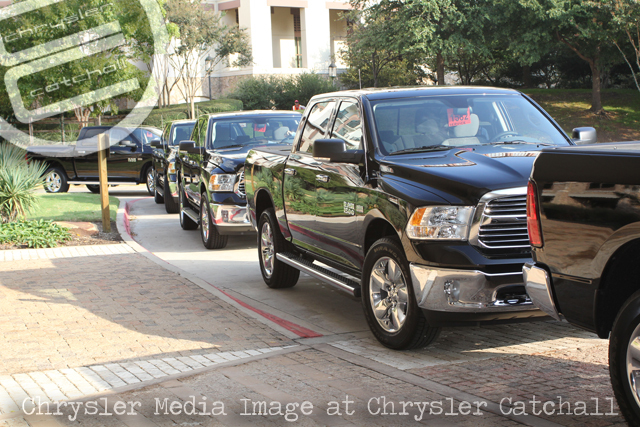 More than 250 dealers from Texas and bordering states picked up 2013 Ram trucks as part of the automaker‘s Drive Away event at the Gaylord Texan Resort and Convention Center. October 12, 2012 , Fort Worth, Texas – The new, highly anticipated 2013 Ram 1500 is here. More than 250 dealers from Texas and bordering states picked up 2013 Ram trucks today as part of the automaker’s Drive Away event at the Gaylord Texan Resort and Convention Center. The event is the first of several across the country that the automaker is hosting as part of the vehicle’s official launch. The vehicles coming out today are 2013 Ram 1500 Lone Star and Big Horn editions, the most popular Ram models in the State of Texas. Depending on the dealer, Carr said, the vehicles being driven away today will be available for test drives and sale this afternoon. This truck marks a milestone for the company as the new 2013 Ram 1500 delivers best-in-class fuel economy of 18 MPG city and 25 MPG highway with a truckload of pioneering, fuel-saving systems including a more fuel efficient and more powerful 3.6-liter V-6 engine and first-in-segment technologies: eight-speed automatic transmission, stop-start system, thermal management system, pulse-width modulation and active aerodynamics, including grille shutters and air suspension. The 2013 Ram 1500 is available in nine trim levels and starts at $23,585 including a $995 destination charge. Dealers outside of Texas participating in the event were from Oklahoma, Arkansas, Louisiana, Mississippi and Tennessee. The Ram Truck brand continues to establish its own identity and clearly define its customer since its launch as a standalone vehicle brand. Creating a distinct brand for Ram trucks has allowed the brand to concentrate on how core customers use their trucks and what new features they’d like to see. Whether focusing on a family that uses its half-ton truck day in and day out, a hard-working Ram Heavy Duty owner or a business that depends on its commercial vehicles every day, Ram has the truck market covered. The Ram Truck brand has the most innovative lineup of full-size trucks on the market. Ram Truck has emerged as a full-size truck leader by investing substantially in new products, infusing them with great looks, refined interiors, durable engines and features that further enhance their capabilities. Truck customers, from half-ton to commercial, have a demanding range of needs and require their vehicles to provide high levels of capability. Ram trucks are designed to deliver a total package.